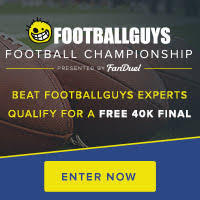 I just posted my Championship Weekend FanDuel stacks. It's my 20th and final stacks article of the season. And it's completely FREE! Here's one stack idea. Be sure to check out the full article for tons of other stacks. During their last five games, only two teams allowed tight ends to overperform more than the Cardinals. Cornerback Tyrann Mathieu's absence has left the middle of their defense vulnerable, and Olsen will be this week's beneficiary. This will be a popular pairing, but tight end isn't the position to find differentiation this week. Twist: I like Ted Ginn Jr. ($6,200) or Devin Funchess ($5,100) in triple stacks. Funchess will be lower owned and is the better value, but you can decide based on how much money you spend at other positions. Hey, I was wondering, if maybe you could write some kind of guide for complete newcomers? Something like this one perhaps? Don't get me wrong, that one is great, but I really like to stay informed and hear different opinions.